1) A heat-fixed smear is flooded with a basic purple dye, usually crystal violet. Because the purple stain imparts its color to all cells, it is referred to as a primary stain. 2) After 1 minute, the crystal violet is drained off and washed with distilled water. The smear is then covered with Gram's iodine, a mordant or helper. When the iodine is washed off, both gram-positive and gram-negative bacteria appear dark violet or purple. 3) Next, the slide is washed with alcohol (95% ethanol) or an alcohol-acetone solution. This solution is a decolorizing agent which removes the purple from the cells of some species but not from others. When the procedure is carried out, the slide is held at an angle and 95% ethanol is poured until the draining solution no longer has a purple tint. 4) The alcohol is now rinsed off with distilled water and the slide is then stained with safranin, a basic red dye known as the counter stain. The staining process is allowed to be carried out for 2-3 minutes. The smear is washed again, heat dried and examined microscopically. The purple dye and the iodine combine in the cytoplasm of each bacterium and color it dark violet or purple. Bacteria that retain this color after the alcohol has attempted to decolorize them are classified as gram-positive. Bacteria that lose the dark violet or purple color after decolorization are classified as gram negative. Because gram-negative bacteria are colorless after the alcohol wash, they are no longer visible. This is why the basic dye safranin is applied. It turns the gram-negative bacteria pink. Stains such as safranin that have a contrasting color to the primary stain are called counter stains. Because gram-positive bacteria retain the original purple stain, they are not affected by the safranin counter stain. Gram-positive bacteria have a thicker peptidoglycan (disaccharides and amino acids) cell wall than gram-negative bacteria. The latter contain a layer of lipopolysaccharide (lipids and polysaccharides) as part of their cell wall. When applied to both gram-positive and gram-negative cells, crystal violet and then iodine readily enter the cells. Inside the cells, the crystal violet and iodine combine to form the crystal violet-iodine (CV- I) complex. This complex is larger than the crystal violet molecule that entered the cells and because of its size, it cannot be washed out of the intact peptidoglycan layer of gram-positive cells by alcohol. 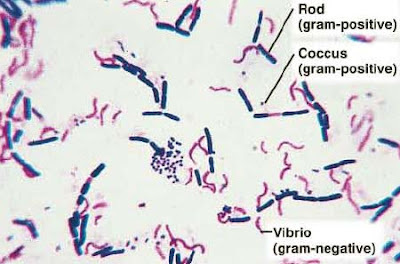 Consequently, gram-positive cells retain the color of the crystal violet dye. In gram-negative cells, however, the alcohol wash disrupts the outer lipopolysaccharide layer and the CV- I complex is washed out through the thin layer of peptidoglycan . As a result, gram negative cells are colorless until counterstained with safranin, after which they are pink. 1) Young cultures of around 18-24 hours. 3) Fresh reagents of proper strength. yeah! this is a very good article about gram staining. now I see it clearly. One doubt if saffranin is added as primary stain instead of CV and counter stain as CV what will be the result.